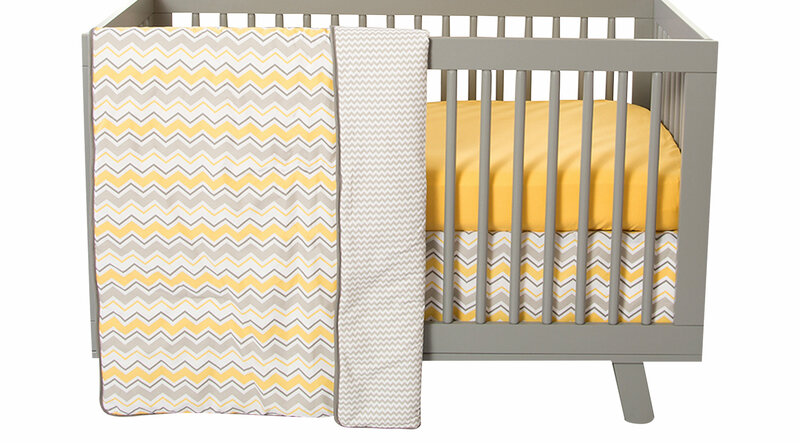 Like a ray of sunshine, the Buttercup Zigzag bedding set brightens up your nursery. Featuring a fashionable chevron pattern mixed with yellow, gray and white, it has an upbeat contemporary look. The reversible quilt has a gray and white chevron print on the opposite side. This set includes a quilt, fitted crib sheet, and crib skirt. The crib sheet fits a standard 52 x 28 inch crib mattress, and features 8 inch deep pockets with elastic surrounding the entire opening to ensure a secure fit.